White Squash Casserole is an old Southern favorite. 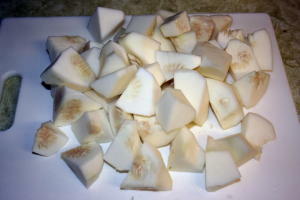 The white squash is not as sweet as say the Butternut, and it is usually prepared as a savory dish with meat and sometimes cheese. A White Squash Casserole is not something you see very often because the White (Paddy Pan) Squash is just not one of the better squashes when it comes to flavor. It's a squash that keeps well and is used a a filler. Remember, years ago it was about being full... it wasn't all about the flavor. I've seen some recipes for white squash that had so much other stuff in them there is no way you could even taste the squash. Cut the squash in four to make it easier to peel. 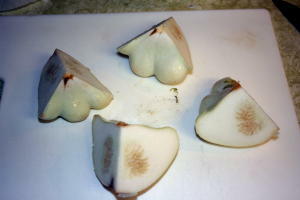 If the squash is big cut the seeds out, but, know that even thought they are big they are mostly tender. Boil quash until fork tender, drain and set aside. 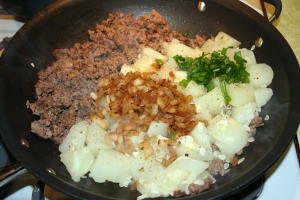 Sauté onion in a frying pan until wilted and remove from pan. Brown meat and drain oil. 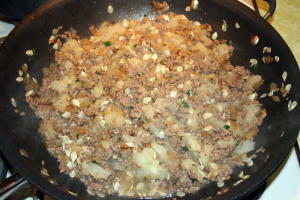 Here you see the onions, green onions, squash and ground meat. Mix all ingredients, add salt and pepper and Cajun seasoning and taste; add seasoning as desired. See the seeds? They don't matter. 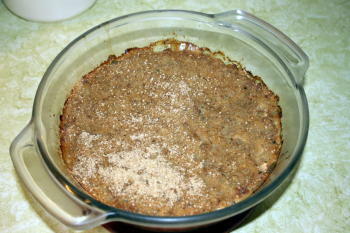 Put ingredients into a casserole dish, top with bread crumbs and bake at 365ºF until crumbs begin to brown. Squash gives off a lot of water so if the dish looks wet don't be alarmed. Just put the crumbs on and bake it for about 45 minutes. The crumbs don't have to be brown. Or, if you want brown crumbs just drain off some of the liquid. However, if you do that, the dish becomes just a little dry. It's a trade off.